Swan Hill Hire has come a long way since its establishment in 1986 by Peter Kerr, who operated a ‘one man show’ in a small tin shed in the original industrial area of Swan Hill for 13 years, writes Hartley Henderson. Back then, stock was mainly limited to domestic and trade equipment which was out of the financial reach of most builders and home handymen. In 1999, the business was purchased by Neville and Sharen Roesler who moved it to its current purpose-built premises at the south end of Swan Hill on the Murray Valley Highway. Over the next 16 years the business expanded significantly and included the establishment of Nifty’s Auto Rentals. In November 2015 Stuart and Raelene King acquired the Swan Hill Hire and Nifty’s Auto Rentals businesses with a view to pursuing opportunities for future growth. Stuart is a Swan Hill local and brings to the business his broadacre family farming background along with a Degree in Civil Engineering and many years of experience in construction projects. Raelene has a family history in the transport industry as well as many years of farming experience, and still works part-time outside the hire businesses as a registered nurse and aged care trainer. 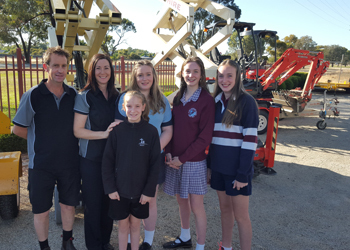 Stuart and Raelene have four daughters who also assist in the business. The businesses service an area which spreads in an approximate 150km radius from Swan Hill, taking in other regional centres such as Kerang, Charlton, Sea Lake, Hopetoun, Manangatang and Robinvale, and in NSW Tooleybuc, Balranald, Moulamein and Barham. Hire equipment available ranges from excavators, access equipment, scaffolding, generators, lighting plants, air compressors, pumps, and pressure washers to portable toilets, showers and site buildings. In addition, Nifty’s Auto Rentals offers a modern fleet of vehicles including sedans, utes, trucks and buses. 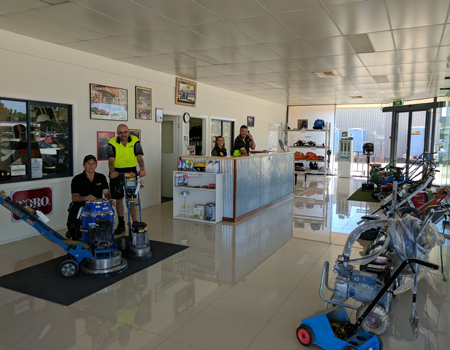 Stuart explains that given both the geographic location and customer demographic, Swan Hill Hire has a wide range of equipment and does not specialise in any one area in particular. “Our key market segments include the domestic segment with the traditional home handyman, business, commercial and corporate operations, and the government sector. In particular, we have a strong and loyal following in the home handyman and weekend warrior market and we are successfully educating our domestic customers in better and safer ways to undertake their tasks. As a result we are experiencing an increase in the use of our professional equipment, particularly in the elevation platform range, by domestic type customers,” he told Hire & Rental Australasia. “Our business, commercial and corporate customers are typically local tradies such as domestic and commercial builders, plumbers, electricians and signwriters, and we also service national brands such as the major supermarkets and fuel companies. “Swan Hill Hire also supports three local governments in our region with a wide variety of equipment – the Swan Hill Rural City Council, Gannawarra Shire (Kerang) and the Murray River Council in NSW. Stuart believes Key Performance Indicators are essential in successfully managing the business’s performance and identifying the areas which may require specific monitoring or improvement. Several basic KPI’s have been initiated including financial, stock utilisation, timeliness, availability, delivery and safety. “Given we are in a rural environment servicing many varied markets, we have found it is extremely important to stay relevant and to have a wide range of well maintained, presentable and up-to-date equipment. Customers appreciate our efforts to invest in new equipment and new technology,” he said. “We almost need to be prophetic in knowing the needs of the customer before the customer realises they need it. In our comparatively short time in the industry we recognise there are items of plant that were previously popular that are no longer as popular to hire. “Hiring of power tools is becoming a thing of the past. Even things like cheaply branded jack hammers can be bought at general handyman stores for the cost of two or three hires. If it lasts longer then that’s a bonus, otherwise throw it away and get another one. It continues to be a challenge in our throwaway society. 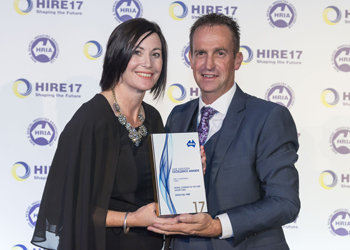 Swan Hill Hire was recently awarded HRIA Rental Company of the Year and Stuart is already planning to build on that success and further grow the business. Drawing on his experience as a civil engineer on major construction projects, plans are being developed to offer construction site set-up, together with management and servicing to support the efficient commencement and operation of large projects undertaken by external contractors. “Already we have provided equipment to NSW Roads & Maritime Services for major maintenance on the Swan Hill and Barham Murray River bridges, as well as to Goulburn Murray Water and associated contractors, for implementation of projects relating to the major redevelopment of irrigation infrastructure,” he said. “In our region there are a number of major projects planned in the next one to five years, so we believe this will have a significant beneficial impact on the economy of the region. These include ongoing irrigation improvement projects, Murray River bridge maintenance, plans for two new Murray River bridge crossings, up to three planned solar farm developments, potentially two new mine construction projects, and Murray Basin rail upgrade projects. “Additionally, farming in our region is a major economic sector. With the expansion of various agricultural industries and the ongoing expansion of markets into Asia, the economic outlook for these industries, and the flow-on effects into other industries and businesses, looks very positive. There is an ongoing need and demand for hire equipment from all of these areas.